HTC has announced a new mid-range phone in the form of the Desire 650, which boasts premium specs at a lower price than the HTC 10. HTC is selling the Desire 650 on its brand new design, with the top half of the phone's rear offering a smooth material and the bottom half grooved for better grip. On the front is a 5-inch 720p display protected by Corning's Gorilla Glass technology. It features HTC Night Mode, which works in a similar way to Night Mode on iOS to stop a strain on your eyes when using your phone at night. The back of the Desire 650 features a 13MP sensor with backside illumination to help with low-light conditions and panoramic shots as well. There's also a 5MP front facing camera that boasts a beauty mode and voice controls for when you can't hold your phone. The highlight may be the HTC BoomSound tech inside, used to create a high-res audio experience whether you're using the speakers or headphones. Under the hood is a Qualcomm Snapdragon 400 system on a chip - not the most powerful set up we've seen in a mid-range phone - and a disappointing 16GB of storage. It does support microSD cards up to 2TB, but it's unlikely you'll use any cards over 128GB. Color choices include Dark Blue and Lime Light and the phone will be available in the UK from O2 in February. There are no announcements on availability in Australia or the US, so for now we assume the phone won't come to those markets. 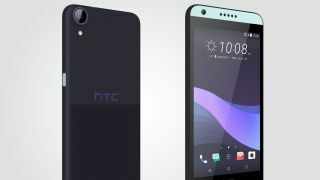 There's no word on how much this will cost, and HTC has said it will give us more details as soon as possible.